NGC 1929 is a star cluster embedded in the N44 nebula, which is found in the Large Magellanic Cloud. Massive stars in the cluster produce intense radiation, expel matter at high speeds, and explode relatively quickly as supernovas. Winds from the massive stars and shocks from the supernovas carve out "superbubbles" in the gas seen in X-rays by Chandra (blue). Infrared data show dust (red) and cooler gas and optical light (yellow) reveals where ultraviolet radiation is causing the gas to glow. This composite image shows a superbubble in the Large Magellanic Cloud (LMC), a small satellite galaxy of the Milky Way, located about 160,000 light years from Earth. Many new stars, some of them very massive, are forming in the star cluster NGC 1929, which is embedded in the nebula N44. The massive stars produce intense radiation, expel matter at high speeds, and race through their evolution to explode as supernovas. 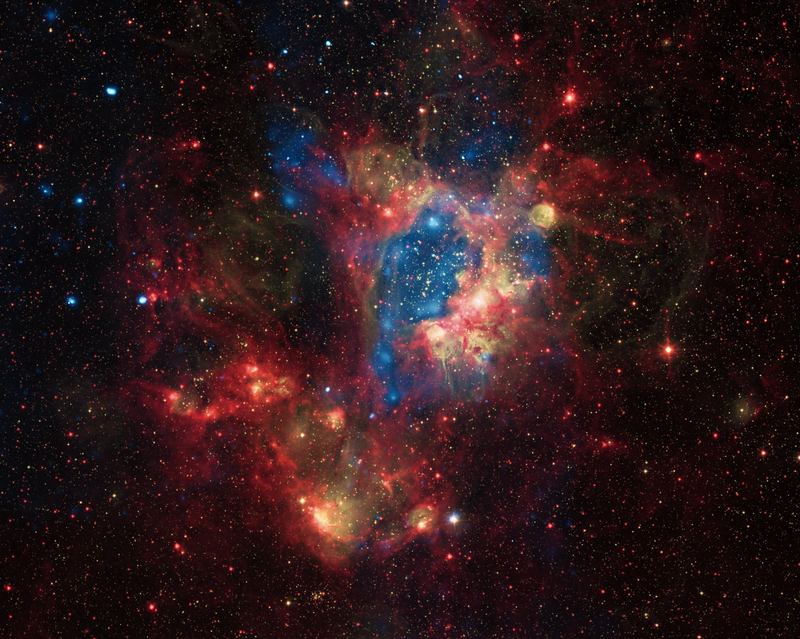 The winds and supernova shock waves carve out huge cavities called superbubbles in the surrounding gas. X-rays from NASA's Chandra X-ray Observatory (blue) show hot regions created by these winds and shocks, while infrared data from NASA's Spitzer Space Telescope (red) outline where the dust and cooler gas are found. 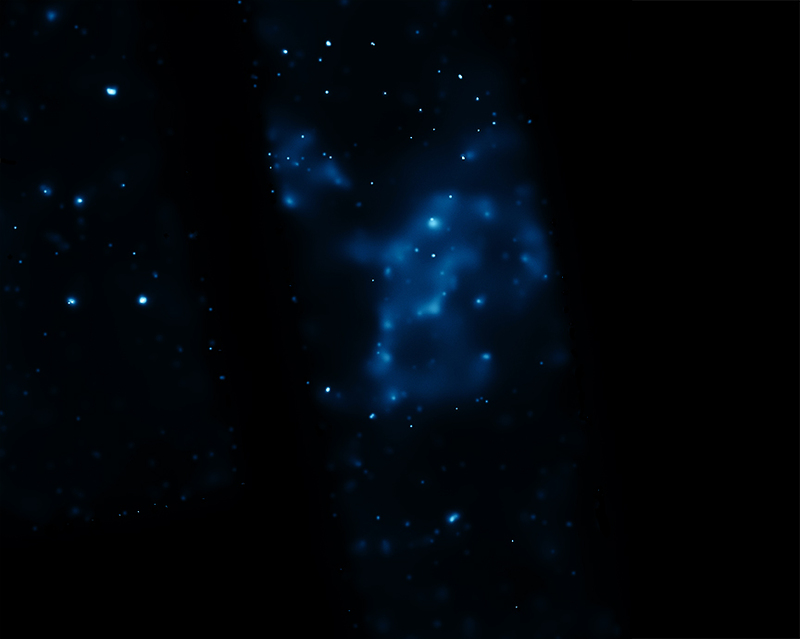 The optical light from the 2.2m Max-Planck-ESO telescope (yellow) in Chile shows where ultraviolet radiation from hot, young stars is causing gas in the nebula to glow. A long-running problem in high-energy astrophysics has been that some superbubbles in the LMC, including N44, give off a lot more X-rays than expected from models of their structure. A Chandra study published in 2011 showed that there are two extra sources of the bright X-ray emission: supernova shock waves striking the walls of the cavities, and hot material evaporating from the cavity walls. The observations show no evidence for an enhancement of elements heavier than hydrogen and helium in the cavities, thus ruling out this possibility as an explanation for the bright X-ray emission. This is the first time that the data have been good enough to distinguish between different sources of the X-rays produced by superbubbles. The Chandra study of N44 and another superbubble in the LMC was led by Anne Jaskot from the University of Michigan in Ann Arbor. The co-authors were Dave Strickland from Johns Hopkins University in Baltimore, MD, Sally Oey from University of Michigan, You-Hua Chu from University of Illinois and Guillermo Garcia-Segura from Instituto de Astronomia-UNAM in Ensenada, Mexico. Coordinates (J2000) RA 05h 22m 17.00s | Dec -67° 76´ 38.00"
A very good book on the subject. Can you please identify somehow the largest stars in the cluster(s), their sizes and the estimated age of the nebula? Also what is thought of as the mechanism for this particular cluster growth? Do you expect there was a supernova at this location in the past? If so wouldn't you expect more heavier elements to be present? Or do you expect some type of tidal energy from perhaps the Milky Wave to have caused this explosion of stars? Any chance of the large versions of the Xray, IR, and Optical images? I wanna toss them all in a folder and make Windows cycle them as my desktop (across 2 monitors) for a while. A superbubble in the Large Magellanic Cloud (LMC). X-rays from Chandra X-ray Observatory, Optical from the 2.2m Max-Planck-ESO telescope in Chile and Infrared observations from Spitzer. About 1200 light years across. X-rays are blue, infrared red and optical yellow.